A super hot topic in most organizations is how to make the most of the troves of social data available. 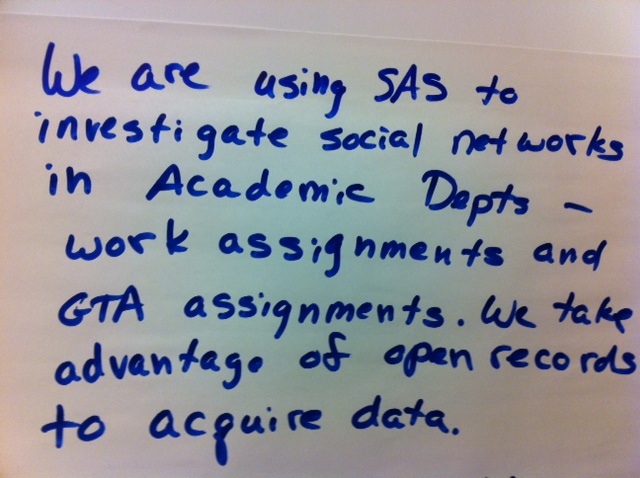 This Post-It Note author isn't specific about the SAS solution that is being used, so I'm going to speculate that he or she is taking advantage of SAS Text Miner, SAS Text Analytics and/or SAS Social Network Analyis. Justin Plumley wrote a fantastic blog post (Voices in the Crowd) about how he mined and categorized the social media discussions that occurred during the 2012 London Olympic Games. In a followup post, Dan Zaratsian shows how to follow social chatter through to the social networks beyond - finding influencers. He uses Social Network Analysis - also an excellent way to track fraudsters. Finally, if you are already a using SAS Text Miner, check out these great updates in the new release - Text Miner 12.1. Has your company been working to gather information from the social sphere? What methods are you using? Are you thinking of writing a paper for SAS Global Forum about your results!?! GO for it!! According to Carlos André Reis Pinheiro, social networks in communications are easy to understand and detect, so Oi Telecommunications chose that route first when trying to detect fraud. Community detection for fraud proved to be somewhat different. It is a progressive search, from looking at the entire network to looking at a group of customers and then within those groups to find unexpected behaviors - outliers. Pinheiro said that the first step is cleansing the data to remove phone numbers that are constants across the network. Those numbers might include the call center number and extensions from international calls. According to Pinheiro, large networks, such telecommunications networks, follow a power law distribution, meaning they contain a small number of communities with a large number of nodes and the majority of the communities have only a few nodes. You can change the size of the communities by changing the value of resolutions. Bigger communities mean more members, but weaker strength in the links that connect them. Conversely, smaller communities have fewer members but stronger links among the nodes. This metric, called modularity, is the average number of distinct connections. In this research, Pinheiro says that Oi Telecommunications collected three months of data. From the data, they could see those customers who seemed to be committing fraud, flag them and follow them through to the next step. “When you talk about social network, we all think about influence. People are influencing others to follow along in some type of event – like churn or a purchase,” said Pinheiro. The data from the social network analysis show that in the churn field, the viral effect of communities is very real - 11 percent of churners can play as leaders and they can affect 8 percent of the people they are related to. “When you talk about purchasing, 14 percent of our purchasers can play as leaders and they can influence 17 percent the entire network,” said Pinheiro. For analysts, the bad news is that there is no viral effect in fraud. Fraudsters create a community with the express purpose of committing fraud. The good news is that there is no viral effect – fraudsters don’t spread their ideas like those who are thinking of changing providers or who’ve found bargain prices. So, according to Pinheiro, he and his team can just change tactics to search for fraud communities. Pinheiro says that social network analysis now helped them see the differences in the calling patterns within a community. These differences were measured so that outliers became obvious and investigable.